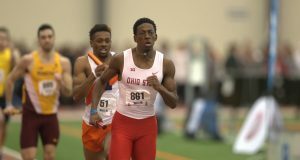 After years of being just a student, senior Malcolm Branson was offered a walk-on spot with the OSU track team, and joined the Buckeyes in September. Branson was discovered by coaches after competing in the fastest-student race at halftime of the 2014 football Spring Game. 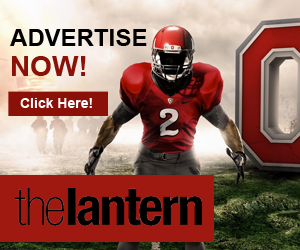 About a year ago, senior Malcolm Branson was racing against fellow students, including Ohio State football players, at halftime of the 2014 Spring Game at Ohio Stadium. Now, Branson is racing toward a new finish line. 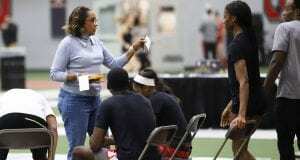 Just months after taking on then-OSU football player Doran Grant in the fastest-student race on April 12, 2014, Branson was contacted by OSU associate head track coach Rosalind Joseph to gauge his interest in trying out for the track program. Branson tried out in August, but didn’t exactly impress the coaches right away. Karen Dennis, the director of track and field and cross country at OSU, said she wasn’t sure if Branson was going to make an impact at all at first. Despite Dennis’ skepticism, Branson continued to show up at practice and tryouts, eventually winning Dennis over. After years of being just a student, Branson was offered a walk-on spot with the Buckeyes and joined the team in September. Branson said that while he was not offered an athletic scholarship, the decision to accept a walk-on position was pretty easy to make. 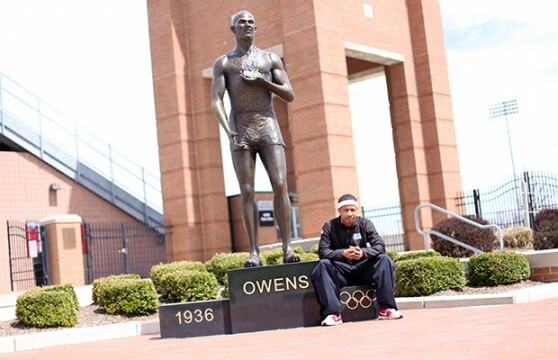 He missed the competitiveness that he experienced while running track in Massillon Perry High School. Branson received his undergraduate degree in criminal justice in December, but continued to pay for classes beginning in the spring so he could continue to compete. 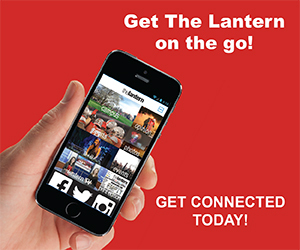 He is now taking classes in psychology and plans to apply for jobs with law firms upon leaving OSU. But with the season currently in full swing, Dennis said Branson’s commitment to the OSU track team is unprecedented. Branson said that while he greatly enjoys the competition, one of the things he has appreciated the most is the camaraderie with his teammates. Dennis said even though Branson might have once been an afterthought among his teammates, he now pushes them to improve. One particular instance stands out in Dennis’ mind. “I think he even beat Tim Faust one time. That just surprised (Branson), but at the same time it gave Tim a sense of urgency to improve his own skills,” Dennis said. 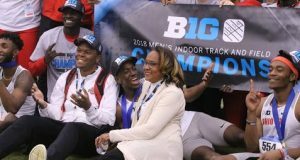 For comparison, Faust is a senior, a three-time second-team All-American and the 2013 Big Ten indoor champion in the 200 meter. 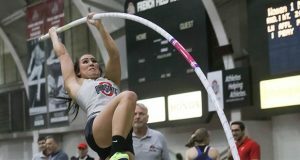 As for the OSU track team as a whole, the Buckeyes are coming off a first-place finish in the All-Ohio championships. In that competition, Branson ran the 100m and finished fourth out of 20 participants with a time of 10.85 seconds. Faust finished first with a time of 10.75. With the outdoor season in full swing, Branson said the team goals are set high for his only season as a member of the Buckeye track program. The next event scheduled is the Virginia Challenge, set for Friday and Saturday in Charlottesville, Va. 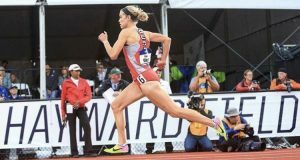 While the Buckeyes will be out of state, Dennis said that because of Branson’s emergence, she will be paying close attention to the second fastest-student competition set to take place at halftime of Saturday’s Spring Game. As for Branson, he said the past year has been a “blessing and a privilege,” and is trying to finish out his first and only year strong. Britt McHenry (ESPN reporter who berated parking attendant) if Coach Karen Dennis heard that her record holding J school grad and former student athlete treated another hard working human being this way she would hit the freaking roof!!! I hope ESPN fires this woman because its bad enough when my child was flown into Bristol for an interview, he/she was worried a ditzy Erin Andrews type would get the job because they either date athletes or get jobs due to their face!!! Britt, I know Northwestern is ashamed it created such an arrogant entitled ditz to say such horrible things. Your apology is worthless because I teach my child “Be careful what you say in anger because some words can’t be forgiven!” What Britt said to that attendant showed her “soul! 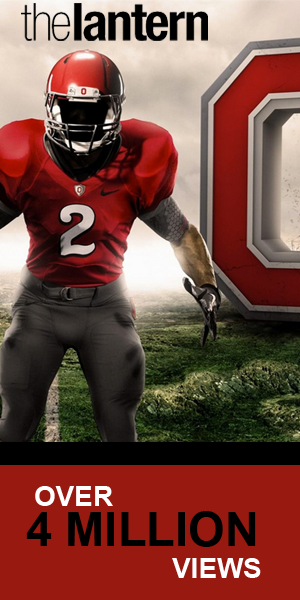 !” THANK YOU Coach Karen Dennis and Ohio State for enforcing to my child my values. 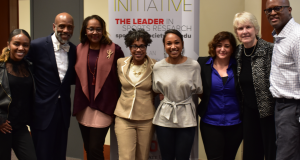 My child had a GREAT ESPN interview experience (an intelligent HBCU female grad got the job which made me happy)!